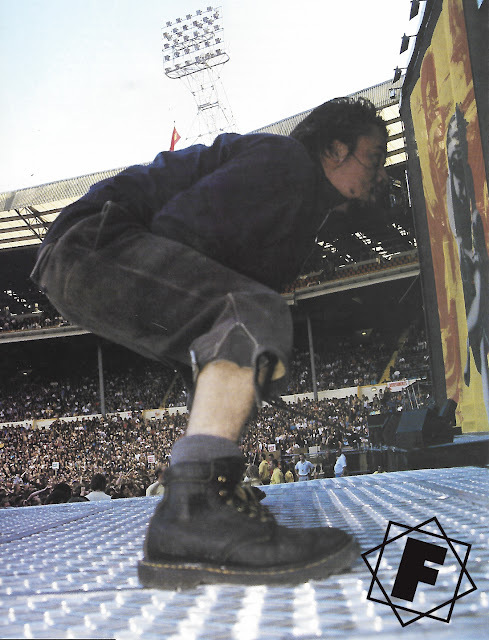 FAITH NO MORE played with Gun N' Roses and Soundgarden Wembley Stadium 26 years ago! 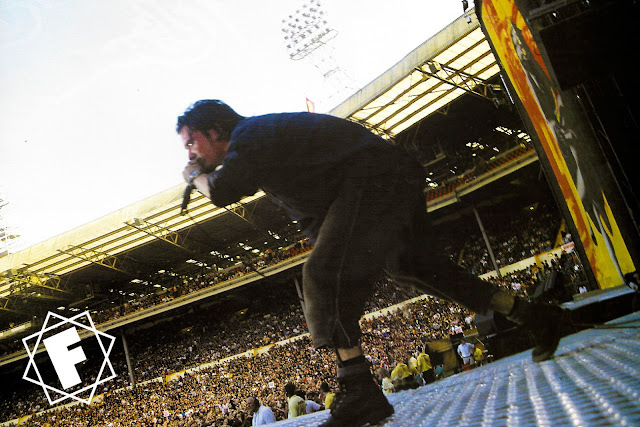 On June 13th 1992 Faith No More played Wembley Stadium in London, sharing the bill with Soundgarden and Guns N' Roses. 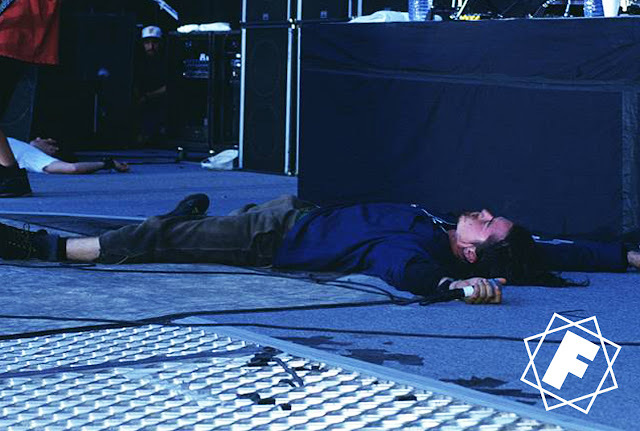 figures walked onto the stage as unobtrusively as crewmen had dune all afternoon, and with the audience still entertaining itself with the Mexican wave, Soundgarden were half-way through their first song before most people noticed there was a band on stage. In a small club a couple of months ago, Soundgarden were stunning, cracking skulls with pounding, well aimed sonic ice picks. But in the vastness of Wembley Stadium, and with a sound that relied on a lot of imagination in order to identify the songs, the audience was being bit with nothing more effective than a plastic hammer. The more-familiar-than-most 'Rusty Cage' was the predictable musical highlight; a surprising cover of Budgie's 'Suicidal Homicidal", however, simply painted a sizeable question mark. 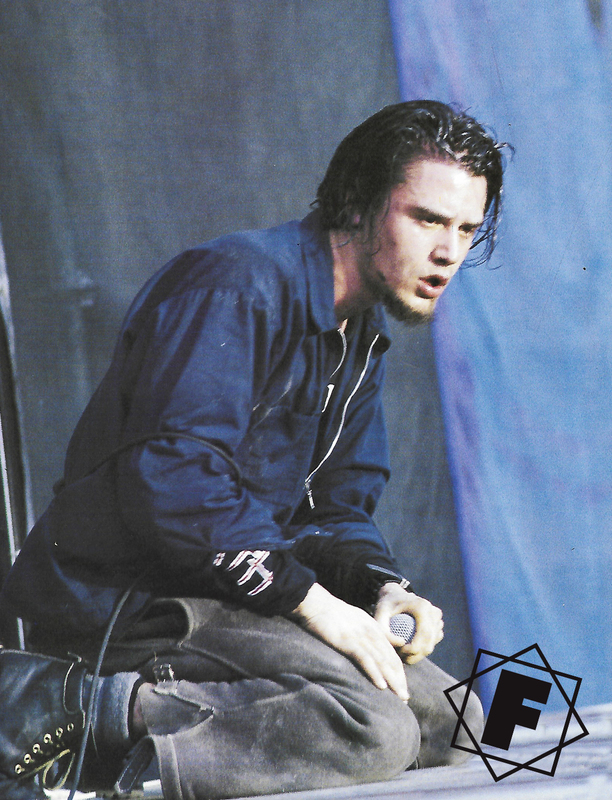 With the temperature having peaked, but the size of the audience still steadily increasing, the predominantly drums/vocals sound that had also sapped the life out of FaithNo More's opening salvo suddenly stabilised into afar more potent mix - just as Mike Patton looked as though he might leave London in a box. Cavorting on a flimsy-looking corrugated iron canopy beneath one of the giant video screens, the audience seemed to be engrossed in a will he-or-won't he debate as to whether the daft git might fall through and break his neck, whilst 'The Real Thing' provided the suitably tense soundtrack to his escapade. FNM's song choice was astute, concentrating mostly on older material rather than promoting the still largely unknown 'Angel Dust' album, Following the gentle waltz of the new 'RV', 'From Out Of Nowhere', 'We Care A Lot', 'Surprise! You're Dead!' and the statuesque 'Epic', all bearing that unmistakable FNM stamp of rhythmic stun-gun and an extraordinary musical elegance, gushed into the air like an invisible but powerful and irresistibly hypnotic; gas. A short, sharp, piercing stab, it was both the best FNM performance I've witnessed, and the strongest evidence yet that Mike Patton is off his head. grins wryly and gives an off-hand "F**k you!". There are equally few people with such a commanding stage presence and charisma. Maybe he is currently the most powerful major-league live performer on the planet. Having suddenly darkened, the stage is ablaze with deep, luxurious reds and blues as Axl introduces 'Sweet Child O' Mine' with an almost impossible shriek, as if his throat is about to burst open like John Hurt's stomach in 'Alien', and the Stadium is on its feet. The lighters and matches dot the darkness again for 'Knockin' on Heaven's Door', and then Guns N' Roses are gone. "I didn't know the band had rehearsed this," says Axl returning to the stage with Brian May to encore first with 'Tie Your Mother Down' and a screaming 'We Will Rock You', with barely a pair of hands in the Stadium resisting the latter's call to participate in its clap-clap-punch. 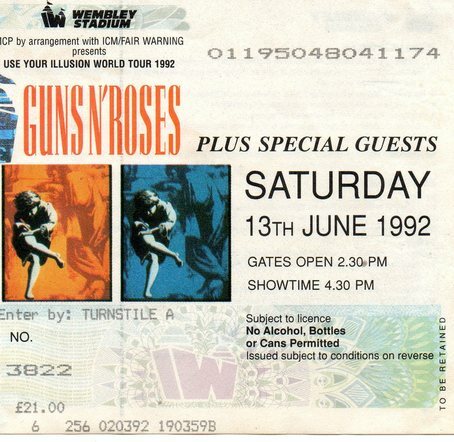 They return again, pyro blasting and the stage bathed in red and white light, to fire a powerful parting shot with 'Paradise City', after which Axl and Slash toss cellophane rapped red roses to the front rows of the audience. The world's most dangerous band? Certainly not - but definitely one of the most enjoyable.